Recipe submitted by Katie Taylor, Chief Customer Officer, Wal-Mart, Hanesbrands, Inc. These Endive Mango Figs are a delicious treat, low in calories and fat. The figs are covered with a low-fat cream cheese spread and your favorite fruits and nuts. Make each fig your own by covering it with a unique topping. Give it a try and they'll be coming back for more! In a small bowl, combine the cream cheese and macadamia nuts. 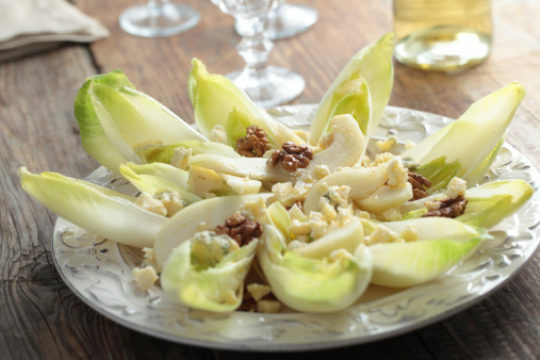 Spread about 1 teaspoon of the cream cheese mixture onto each endive leaf. Top with the mango strips, figs and other fruit choices. Arrange on a serving platter. Prepare as above through step 1. Loosely cover with plastic wrap; chill for up to 2 hours. Before serving, top with mango strips (or other fruit choices). About 24 servings per recipe.